The first thing that is noticeable in this film is its hyper-apparent score that come on strong in the early scenes. It meanders or drones, almost whirring a mechanical hiss at us. It implores us to be afraid of a presence we cannot see, but it only truly serves to be simple and uninspired. The ghost story begins in the same cliche way that most do: a stranger who knows the area well appears out of thin air to explain the ill-fated history of the house our protagonists have recently moved into. The stranger is unusually cryptic and utterly fascinated by the macabre presence. It is a tired trope of haunted house and other slasher films that doesn’t serve this movie well. The acting in this film is nothing to marvel at. At times, the two leads make it work naturally, but most lines are delivered stiffly or awkwardly. The supporting cast, too, fails to bring depth to the proceedings, and only serve the purpose of being extra bodies. The escalation of this movie is eyebrow-raising (in a good way). Director Ted Geoghegan makes no attempt to misdirect or hide the reality of the house’s spiritual unrest. He does, however, wonderfully pace out the crescendo to chaos into deliberate beats. Unfortunately, between these beats is a mish-mash of hurried and forced exposition. In an attempt to create a mythology for the town and the haunted house, the movie gets haunted by a bumpy flow and shoddy writing. There is some initial intrigue in learning the origins of the environment, but there is something to be said about leaving some things to the imagination. We Are Still Here has some cool moments. A seance that slowly turns sour makes for some grim fun. All of the visuals are stellar for an indie horror flick. The balls-to-the-wall climax is a blur of grisly insanity. Still, other nonsensical or unnecessarily expository scenes hamper the films cadence to the point of grinding it to a complete standstill. 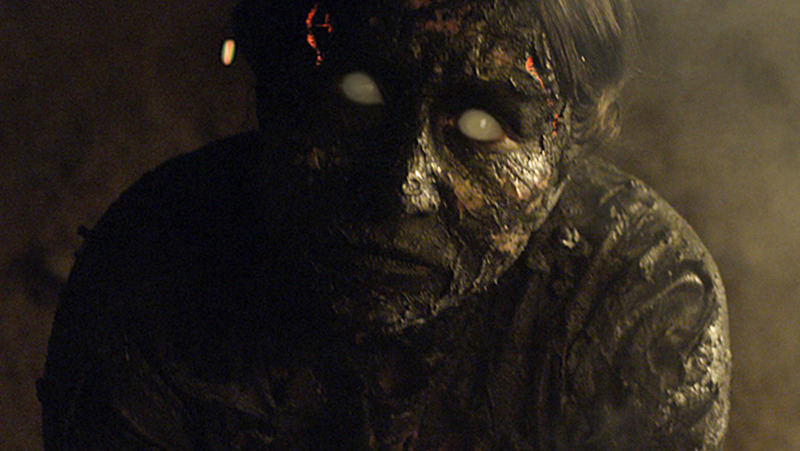 Given the somewhat sad state of popular horror in recent years, We Are Still Here succeeds as a carefully crafted, ambitious indie. It could have used some fine tuning, but overall it is a moody pic that unspools into gory mayhem. And, sometimes, that’s all you really need. Have you seen We Are Still Here? If so, what did you think? Let me know in the comments!